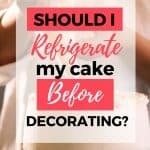 Should I Refrigerate My Cake Before Decorating? 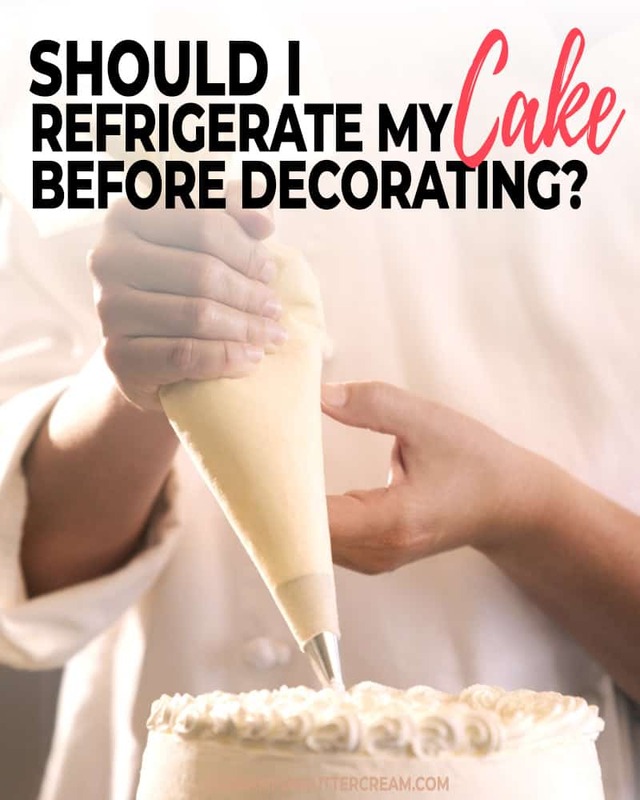 If you’re new to cake decorating, you may be asking yourself, should I refrigerate my cake before decorating or should I put my cake in the fridge before frosting? 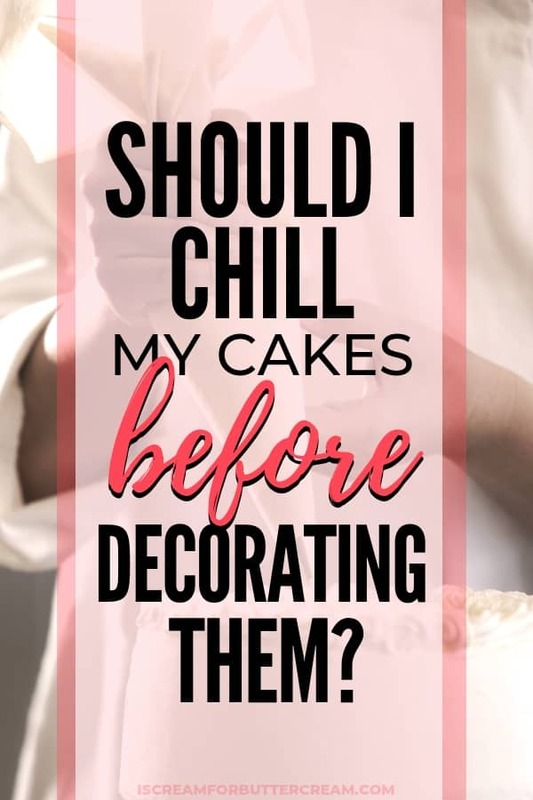 Here is my best advice on when and when not to chill cakes in the decorating process. Over the years, I found what works and what doesn’t work and I’m happy to share my tips here. This post contains affiliate links, which means I will receive a referral commission, at no additional cost to you, if you make a purchase using these links. As an Amazon Associate, I earn from qualifying purchases. This post is slightly controversial. Not controversial as say political goings on, but it might be a little controversial in the cake decorating world. 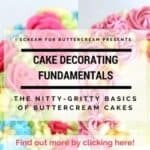 In this post I’m going to tell you why I don’t chill my cakes while decorating…usually. Now, I say ‘usually’ because there are actually times when I do chill them, but that’s usually the exception. 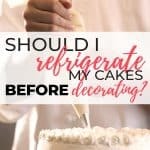 I know that a lot of cake decorators like to chill their cakes during the decorating process and I know that many will not agree with me and that’s okay. 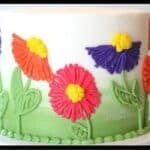 What I WILL say is that if you’re having trouble with icing ridges, buttercream bulging, or you decorate your cake and come back later to a disaster, then you might want to try a different method. I have learned that some cake decorators are very, shall we say, defensive about their methods. I also want to say that I’m not saying anyone is doing it the wrong way. I’m just simply talking about what works for me after much experimentation. We all have our methods that work best for each of us, so my advice is to try out different ones and see what works best for you. You may love chilling cakes while decorating and if it works for you, then that’s great. Some decorators even like to decorate their cakes, not only chilled, but partially frozen. I will tell you that I have ALWAYS had trouble decorating them cold. They look perfect once iced, but when they come to room temperature to serve, buttercream bulges and icing ridges appear. I have a couple of theories about why I think that happens that I’d like to share with you. These are air pockets that push the buttercream out from the cake. I think they happen because of moisture between the cake and the buttercream. When you chill cakes and then ice them, there’s condensation on the cake. That’s moisture between the cake and the icing. Once the cake comes to room temperature, it’s like that moisture just pushes the buttercream away from the cake. I have no scientific proof of this, but when I keep my cake layers at room temperature and decorate them that way, it doesn’t seem to happen. These things happen because the cake layers settle and push out the filling a bit. Even if you don’t overfill your cakes, it can still happen. I know you’ve probably heard of the icing dam. 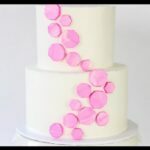 It’s a ring of buttercream that you pipe along the perimeter of your cake layer and then fill in with buttercream. It’s supposed to keep the filling from squishing out. Am I the only one that this doesn’t work for? I’ve even heard of people thickening the icing they use for the dam, but I still have issues with ridges that way. 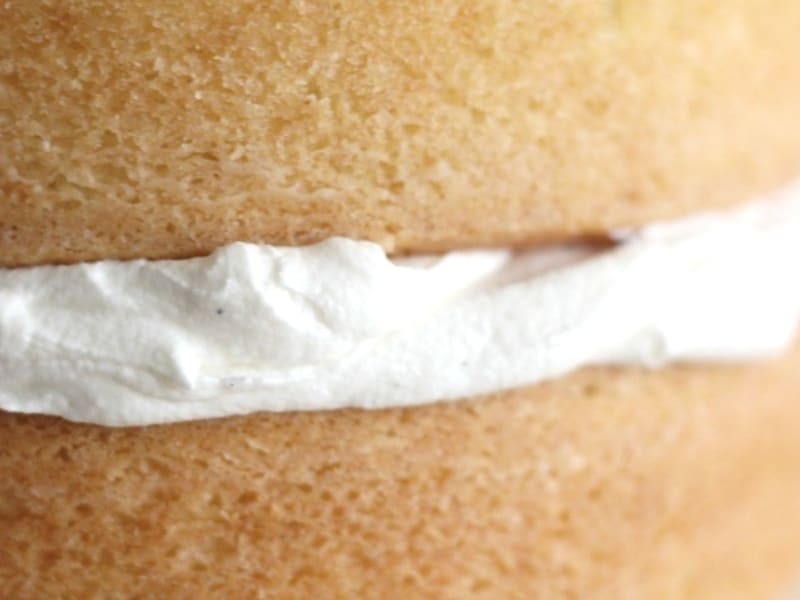 I mean the icing dam is great and really a must if you’re filling your cakes with fruit or curd filling, but if you’re just filling it with buttercream, I don’t even bother with it. My point is, the fix for icing ridges is that your cake needs to have time to settle. Those layers need to be allowed to settle and it’s just gonna push out a bit of buttercream or filling. It needs to do that at room temp. If it’s cold, it’ll just firm up and then do it later when it comes to room temp. 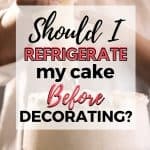 Maybe you’re a cake wizard and this doesn’t happen to you, but in my experience, it really does help to let the cake settle out of the fridge before your last covering of buttercream and decorating. So what does this have to do with chilling cakes? 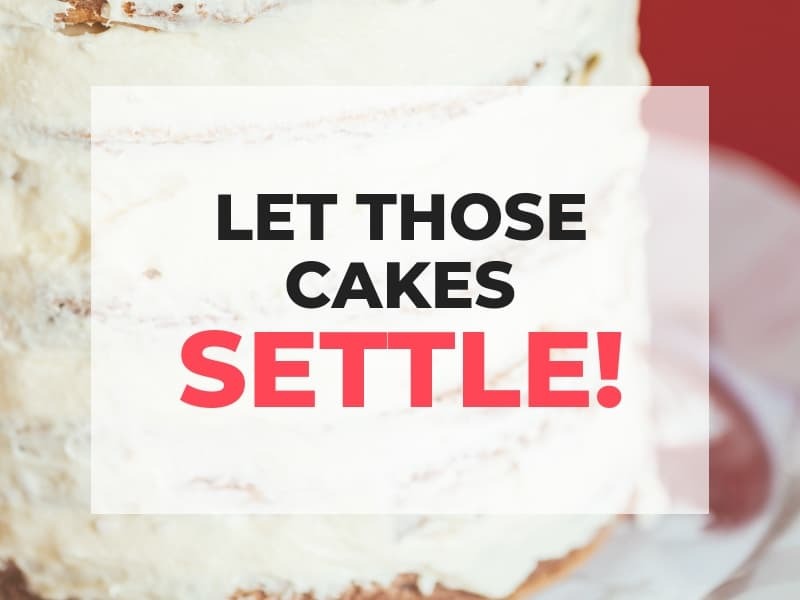 Well here’s the deal: Once you fill and stack your cake layers, that’s when it needs to settle. If you chill it at this point, the whole cake and filling will firm up and it won’t give it a chance to settle. 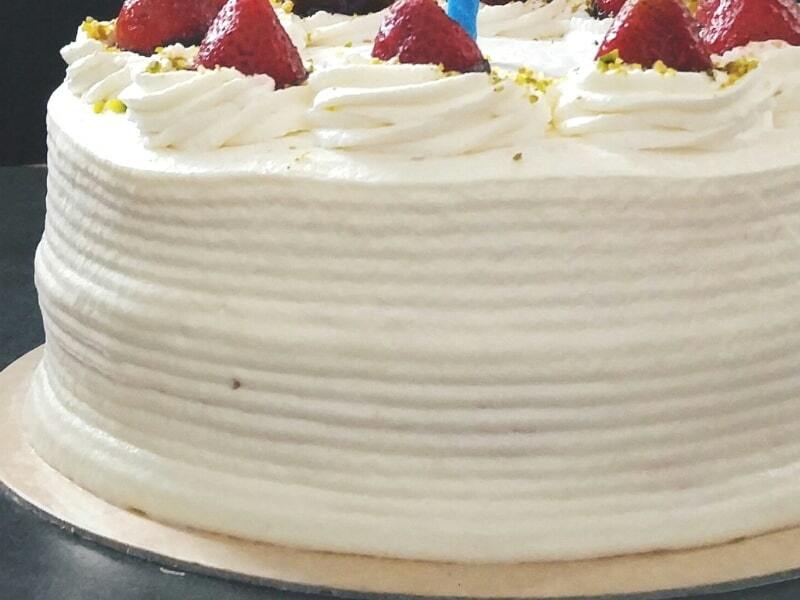 Now, if you’re using a perishable filling, or swiss meringue buttercream, you’ll obviously have to chill it. (I will say that some say it’s okay to leave out swiss meringue for a couple days, but I have always been a little leery about that, so I just refrigerate that kind of buttercream.) Anyway, if you’re using American buttercream, that doesn’t need to be chilled. So here’s what I do: Once I fill and stack my cake layers (not tiers), I just cover the cake with a very thin layer of buttercream. I do this so the cake doesn’t dry out. I then cover it with plastic wrap and put it into a box. Now it’s time to leave it out and let it settle for several hours or overnight if you can. I don’t chill it at this point. Remember, I don’t want it all to firm up…I want it to settle and go ahead and do whatever it’s going to do now as opposed to after I’ve decorated it and then it comes to room temperature. Once it’s settled, I take an icing spatula and smooth out the ridges where the buttercream may have bulged out a bit. Any buttercream that has pushed out, I just smooth it off, then I add my final coat of buttercream or ganache. You could cover it in fondant at that point if you wanted to. So when DO I actually chill cakes? Well like I said earlier, I will chill them if they’ve got perishable filling or frosting, because well, nobody wants to be sick. I also pop them in the fridge for only about 15 minutes before I add fondant. Sometimes I will also chill them for about 20 minutes before transporting them, if it’s really warm outside and I need the cake to be more stable for transport. All in all, that’s the only time I actually chill them. So, I’ll say again that I know many people who chill their cakes, who don’t agree with me and I’m totally okay with that. We all need to do what works the best for each of us and this is my method. If you’re having trouble with your cakes, you might just try it and see if it works for you. One caveat though. 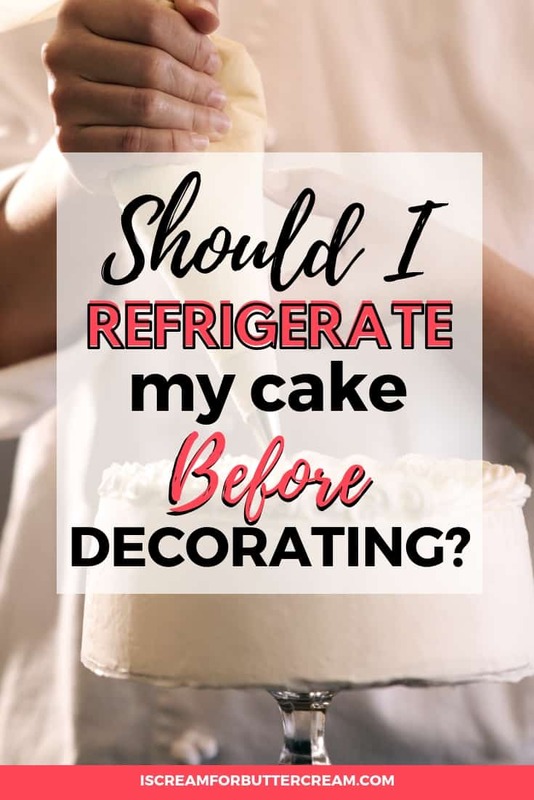 If you live in a warm climate and you don’t have air conditioning, then this method probably won’t work for you, but if you’ve got AC and a bug free zone, cover those cakes, box them up and set them on your counter or table, let them settle and then decorate. Let me know how it goes, ok? 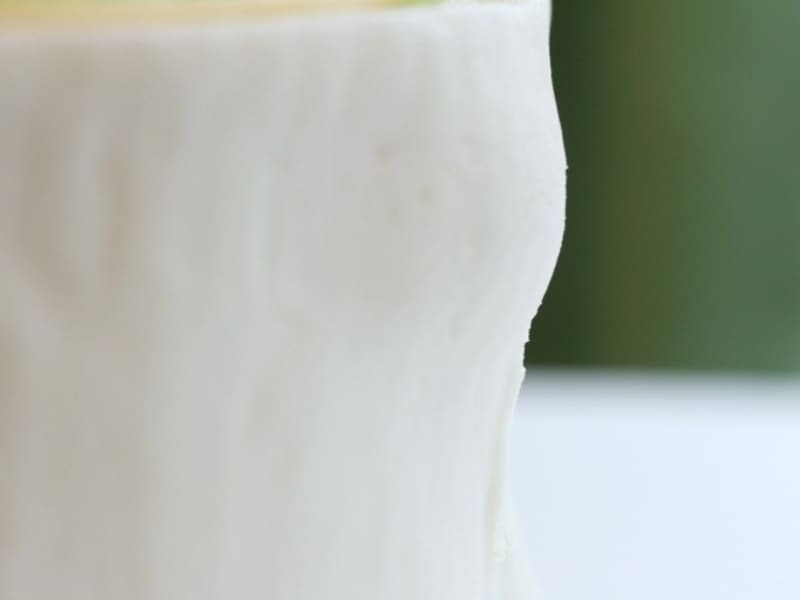 Now, you’ll want to test this out on a cake before you implement this on some big cake order. It’s always good to do test cakes when you’re trying a new method. Remember, never say never because there will always be a time that you have to break the rules. There ARE times when I have to chill the cake. I may have a perishable filling or icing. I may need to do a drip cake in which case the buttercream has to be chilled, so it doesn’t get destroyed by the warm chocolate ganache. So, this method of mine isn’t written in stone. The best thing to do is use your own judgement. My default is to NOT chill them, but if an issue comes up and it’s necessary, I just roll with it. And basically that’s what cake decorators do, right? We just roll with it, because sometimes your cake just has a mind of its own.